In the first edition of the MM Top 5 series in 2014, we look back at 2013 and which films stood head and shoulders above the rest. After whittling the contenders down to just five, it’s time to announce the best five films 2013 had to offer us. The Film: In a year when horror films took a back seat to big blockbusters, remakes and uninspiring sequels, director Adam Wingard decided to think outside the box when creating his horror masterpiece You’re Next. Taking style tips from lesser films in the genre like The Strangers, When a Stranger Calls and to some extent Black Christmas, Wingard managed to create a horror film which wasn’t only downright terrifying, but genuinely funny. Following the story of a family coming together to celebrate a special occasion, Wingard cranks up the tension three-fold when a group of masked killers start terrorising the innocent family unit. The scares come thick and fast but it is the comedic social references which really hit home. Hilarious scenes involving the family scrapping over a delightful meal are brilliantly juxtaposed to create something which simply doesn’t sit right in the mind of the audience. Gore abound, with deliberately terrible dialogue and hideous over-acting, You’re Next is nearly perfect, however, it’s generic middle sequences stop it from placing any higher than fifth in this MM Top 5. Success: You’re Next is a film which proves you don’t need a-list Hollywood talent, a massive budget or even a well-known director to garner box-office success. On a budget of just $1million, the movie went on to gross over $26million at cinemas across the globe. There are rumours that a sequel is in development for release in a couple of years time, but details are still exceptionally sketchy, though this reviewer would love to see the masked murderers return in one form or another. Receiving over 75% positive reviews from critics across the globe, it is one of the best praised horror films in recent times and fully deserves its success. 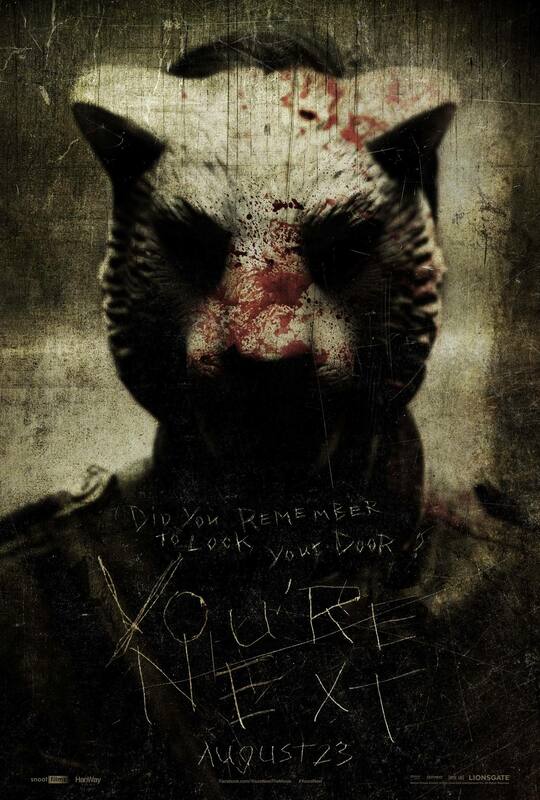 For an in depth review of You’re Next, Click Here. The Film: After the huge disappointment that was Iron Man 2, director Shane Black takes over from Jon Favreau to helm the next sequel in Marvel’s biggest franchise. Robert Downey Jr continues his brilliant form as Tony Stark/Iron Man and brings to the table a much softer, more delicate side to the character than perhaps we are used to, especially considering his acid-tongue in Avengers Assemble. Gwyneth Paltrow returns as Pepper Potts but is sorely underused once again, even though her character has been fleshed out, a little. Set at Christmas (for some reason), Iron Man 3 follows Tony Stark as he comes to terms with his anxiety after the events in Avengers Assemble and tries to battle a foe who isn’t all he seems. The film requires a suspension of belief, more so than any other Marvel offering and takes on a much darker, sombre tone to portray Tony’s fears and deepening depression. In fact, the majority of the film takes place out of the Iron Man suit and fleshes out Tony’s character rather than his alter ego. A risky move by Shane Black but one which works, for most of the its enormous running time. Joining the cast are Guy Pearce as Aldrich Killian, a man who has a bone to pick with Stark after events which took place decades before, and a brilliant Sir Ben Kingsley as new foe, the Mandarin. 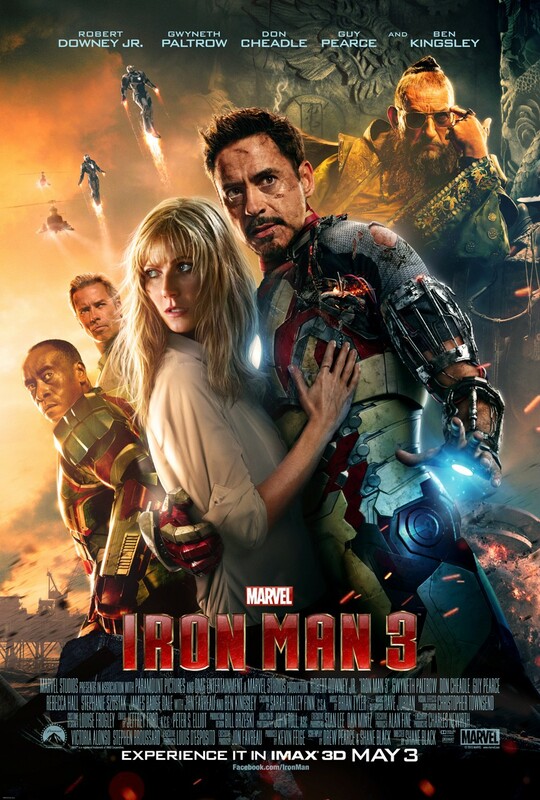 Iron Man 3 is a film which took the strong points of each of the other films and apart from a few lapses, manages to remove the negative aspects. A fully deserved fourth placing in 2013’s top five films. Success: There really is no denying the popularity of the Marvel franchise and Iron Man 3 broke many records when it was released in May last year. Ranking as 2013’s highest grossing film at the box-office, it took an incredible $1.25billion in cinemas worldwide, including over $57million in the UK, Ireland and Malta alone. Critics were equally as impressed as the audiences who went to see the film, only criticising the lacklustre 3D which has blighted many films since its resurrection a few years ago. With a rating of 78% positive reviews, it remains one of the most highly rated Marvel films ever released, which is a true testament to Downey Jr’s brilliant characterisation and Shane Black’s new, bolder and darker direction. The Film: Perhaps a controversial choice here as World War Z was released to a mixed critical response after its turbulent production, but what a film we ended up with. Directed by Marc Foster, who took charge of the rather disappointing Quantum of Solace, World War Z is a roller-coaster ride of adrenaline pumping action, from start to finish. Starring Brad Pitt as Gerry Lane, a UN operative who has retired to spend more time with his children and wife, the film follows his story as he is thrown into the middle of a zombie apocalypse, trying to find out the root of the problem by travelling to numerous countries across the world. Yes, the plot is paper thin, but once you’re strapped in for the ride, you couldn’t care less. Pitt commands the screen and steals the show from the other, rather stilted characters which appear from time to time. World War Z is a truly astounding film, it throws the rule-book of zombie invasions out of the window and creates its own thinking. Gone are the slow, brain-eating corpses of yesteryear, in their place are creatures which move at cheetah-like speed, forming swarms of their own kind to obliterate anything in their path. In one particular scene, mentioned in a previous MM Top 5, we see Pitt’s character on-board an aeroplane as he does battle with infected passengers. A truly horrifying, chest-pumping moment in a film filled with them. Only the anti-climatic finale stops World War Z from placing any higher, but it fully deserves its bronze medal. Success: A massive budget which kept increasing ($190million) rendered World War Z dead in the water before it was even released, and after a very slow start many of the nay-sayers looked like they would be right on this one, but word of mouth finally managed to spread and in the end, the film was a box-office success, grossing over $540million worldwide, much better than the studio was hoping for. Critical acclaim was in short supply, which was partially the reason why the film suffered from a slow opening weekend, but there were people who appreciated the movie for what it was. With an approval rating of 67%, World War Z is the lowest rated film in this list, but it deserves much more than that. 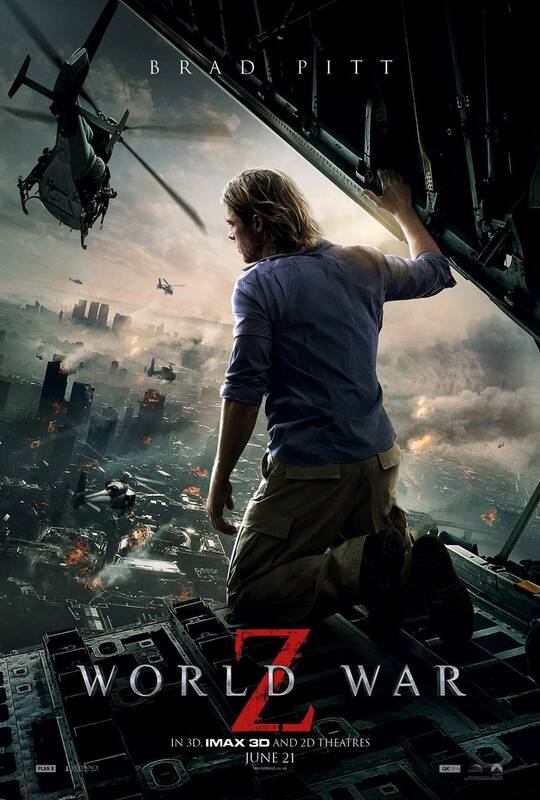 For an in depth review of World War Z, Click Here. The Film: Released in July 2013, Pacific Rim was the brainchild of visionary director Guillermo del Toro and he fashioned a corker of a movie here. 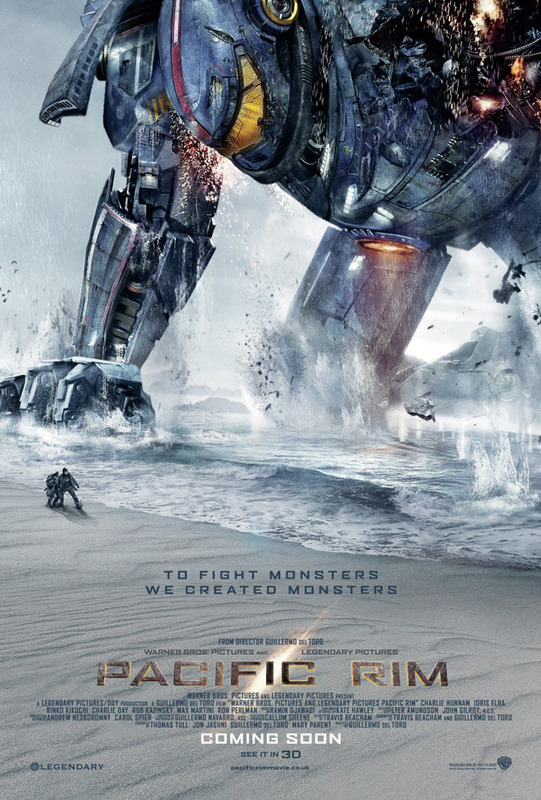 Taking cues from many like-minded films such as Godzilla, Jurassic Park and the Transformers franchise, Pacific Rim adds enough story and differences to make it stand out from the rest. The film follows the story of Earth as it comes under attack from a race of monsters from deep within the Pacific ocean. These beings, the Kaiju are truly gargantuan in size and nothing our planet can do will stop them. Enter the Jaeger program, a group of enormous man-made robots designed to take on the Kaiju and destroy them before they can cause too much damage and death. The special effects are truly revolutionary and show just how much we have come on in the last decade. From the CGI recreations of cities like Hong Kong, to the Jaegers and Kaiju themselves, everything is painstakingly detailed to ensure that these monstrous creatures and robots are as realistic as is physically possible. With a cast of actors like Brit favourite Idris Elba, Charlie Hunnam and ex-Eastender Robert Kazinsky, audiences are treated to characters who play their roles well, because they aren’t getting over the egos that some more well-known people could have put into their characterisation. However, a first-act lull stops the film from clinching the gold medal, and finishes in second place in this top five countdown. Success: Pacific Rim was a victim of poor marketing and suffered at the global box-office because of it. With a budget of $190million, it grossed just over $400million, well below the studio’s expectations. It was a bitter blow for director Guillermo del Toro who expected the film to rival Iron Man 3 as the year’s biggest and best film. It certainly rivalled it in the latter stakes, with superior special effects and a greater focus on creating something which would be remembered for being exceptional and awe-inspiring. Despite its less than stellar performance, a sequel is already rumoured to be in the pre-production stages with Guillermo del Toro returning as director. If it can be half as entertaining as its predecessor, then they’re onto a winner. For an in depth review of Pacific Rim, Click Here. The Film: Based on the second in Suzanne Collins’ successful trilogy of novels, The Hunger Games: Catching Fire was cleverly released in a fairly quiet November when the majority of the big blockbusters had already had their run in the cinematic marketplace. 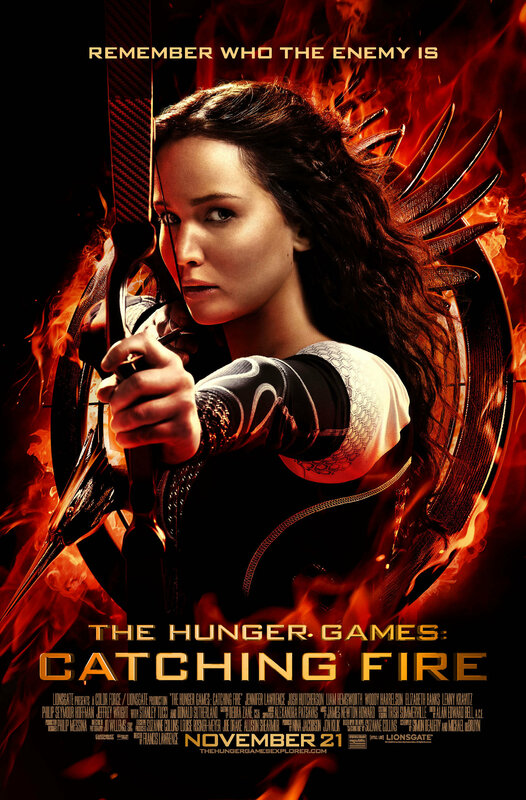 Continuing the story of Katniss Everdeen as she battles the Capitol after winning the 74th annual Hunger Games tournament with her ‘fake’ love interest Peeta Mallerk, the film showcases numerous new additions to the series, from actors and actresses, to foes and arenas, everything has been updated to ensure it can stand away from its predecessor. Jennifer Lawrence returned to the series fresh from her Oscar win alongside Josh Hutcherson, Elizabeth Banks, Woody Harrelson and of course the effervescent Stanley Tucci. The acting talent is sublime, with every performance being simply excellent. Special effects were also given a much-needed boost. Those of you familiar with my opinion of the previous film will know that I wasn’t a fan of the CGI used in creating the Capitol and the ridiculously fake-looking fire. Thankfully one of those has been stepped up a gear, with the Capitol no longer looking like a Star Wars rip-off; the CGI flames still need work however. The Hunger Games: Catching Fire is everything a film should be. From its detailed story to its excellent acting and decent special effects, it is fully deserving of being crowned 2013’s greatest film. Success: It was a film which was predicted to top the billion dollar mark; though it didn’t quite meet analysts expectations it still bettered the previous film’s takings. On a budget that had almost doubled to $140million, it’s box-office gross is a staggering $806million and still growing as the film remains in cinemas now. The sequel, Mockingjay, will be in theatres in November this year and is already hotly tipped to become 2014’s highest grossing film, in a year which may prove tough with the release of Transformers 4 this summer. Catching Fire is truly a film of epic proportions and its critical response rating of 89% positive reflects its standing in the market place. For an in depth review of The Hunger Games: Catching Fire, Click Here. So there we have it, 2013 has been ranked, what do you think? Head on over to the 2014 Film Tracker to take a look at what’s coming over the next 12 months. If you don’t agree with my thoughts, as always, leave a comment in the section below, I read and reply to each and every one! No mention of Walking with Dinosaurs? I think you may have missed a trick there! Perhaps if I was to do a Top 5 2013 Turkeys, it would feature Matt! Thanks for commenting. You probably should, there has been a lot of crap this year! I nominate Man of Steel should you choose to do one! I voted Catching Fire! The Impossible, Olympus Has Fallen and The Great Gatsby are up there for me too. Les Mis too. Thanks for voting and for commenting Aimee! Let’s hope 2014 is as good a year!